Most Haverford garage door repair is best left to a professional, but a homeowner should undertake some routine maintenance to make sure the door is properly functioning. You assume that when you press the “open” button, the door will go up; while it will go down if you hit “close.” If the door works randomly when you push the button, you risk having the door fall on you, your car, or a child or pet. Fortunately, since the early 1990’s, openers have a built-in reversing mechanism so that the Haverford garage door will reverse its direction if something is in the way. You should have a malfunctioning door checked at once to make sure that the door reverses properly upon command. Balance test: Before this test, deactivate your automatic opener by pulling on the cord or pull rope in your Haverford garage. When the door is in manual mode, you should be able to lift it with two fingers. If not, your springs and cables may need adjustment. Visual check: Take a look at the rails, chain/belt, springs, and mounting brackets to make sure that everything appears to be lined up. Lubrication: A couple times a year, lubricate all metal parts with a silicone-based spray or motor oil (not WD-40) to keep the Haverford garage door operating smoothly. Reversal test: Your doors should have a photocell system and a reversal system to assure that the door will stop and reverse if something is in its path. Place a piece of wood on the Haverford garage floor to test to see if the door reverses when it approaches the wood. Also, wave a broomstick in front of the photoeye to make sure the door reverses. If your door does not pass all of the tests above, it’s advisable to call for professional garage door repair. 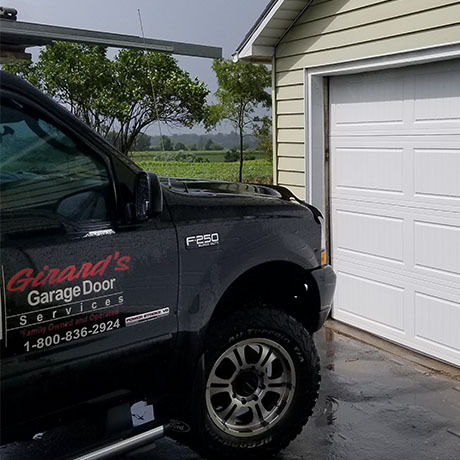 Haverford, PA residents can be assured that Girard’s Haverford Garage Door Services will immediately dispatch an experienced service technician to fix a malfunctioning Haverford garage door, or just to perform a 25 point safety inspection and preventative maintenance. Call contact Girard’s at (610) 446-0891 to learn more about our services or schedule a repair.